What’s the Story with Triazolam and Insomnia? Triazolam, or brand-name Halcion, is a benzodiazepine sleep aid used to treat short-term insomnia, as well as anxiety, seizures and convulsions. Halcion is manufactured by a number of pharmaceutical companies including UpJohn and Pfizer. 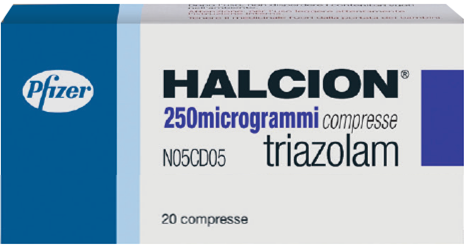 Triazolam or Halcion is considered one of the most powerful controlled sleep medications. Halcion is markedly different from other prescription sleep aids in that it is reserved for very severe cases of sleep onset insomnia. Sleep onset insomnia sufferers have problems falling asleep at night and may experience long periods of frustrating and anxious wakefulness before finally sleeping. Halcion is faster acting than most and provides a much more intense sedative effect. For this reason it is only designed for very short-term use. Its applicability to those patients with sleep onset insomnia is indicated for its very short half-life. In other words Halcion or Triazolam kicks in so fast and depletes itself so quickly that it is completely useless for middle of the night insomnia sufferers or those that experience early waking. This drug is a benzodiazepine—a chemical that binds with the GABA receptor in your brain, which stimulates relaxation and the sedation effect associated with sleepiness. Non-benzodiazepines like Ambien and Lunesta also bind with the GABA receptor but the chemistry is slightly different. Halcion as a brand-name has earned a controversial reputation and is even now banned in some countries. Pharmaceutical company, UpJohn, began deploying Halcion for insomnia treatment back in the early 1980s. But the company was publicly ridiculed in the early 1990s for allegedly withholding damaging studies it conducted on Halcion that showed high risks and serious side effects with use. The company was originally intending the drug to be licensed beyond 2 week use and was accused of intentionally hiding the research to ensure licensure. Many physicians rarely prescribe triazolam due to the high risks associated with the drug. Too many alternatives exist to make it a natural choice for many patients. And many more doctors are discovereing the benefits of behavioral modification, as well, for non-pharma approaches. Applications in which triazolam may be useful is as an anti-anxiety or sedative for patients about to undergo surgery or even frightening dental procedures. It’s also been used effectively to offset the insomnia symptoms related to jet-lag.